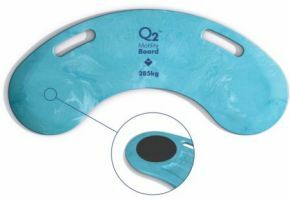 This bariatric heaavy duty curved patient transfer board is a truly universal transfer board. Its unique curved shape and maximum working load of 285kg enable it to be used in virtually all applications, with 99.9% of the population. Ideal for use in both assisted and non-assisted transfers, it can also be used for face-to-face transfers within restricted areas. The inset anti-slip pads on the underside prevent pad detachment and afford maximum grip on the two transfer surfaces. It is lightweight and is easily wiped clean, using either household disinfectants or alcohol-based solutions. Bought for my Son who needed a heavy duty transfer board, delighted with the quality and strength of this. Would definitely recommend.